How should my Ski and Snowboard boots feel? You should be able to wear you boots all day. They should be a snug all round fit with no heel lift – unless you really pull whilst pushing on your toes. The test to do is just flex your legs and roll up onto your toes. You should be able to wiggle your toes a bit too, this helps with blood flow to keep pins and needles at bay and also brings warmth. How should boots feel in the shop when I buy new ones? When you first put the boots on you may well feel the end with your toes. This is right! Unless you have very high volume feet in which case the fitter may well have gone up a half size. Once done up properly (see ‘How to put on Ski/Snowboard boots properly’) your toes should come away slightly. You need to be stood in a flexed (bent knees) position as this is how you ski and snowboard. NOTE: do not sit around in the boots. If you can wear the boots for 5-10 minutes in store then they should be fine! 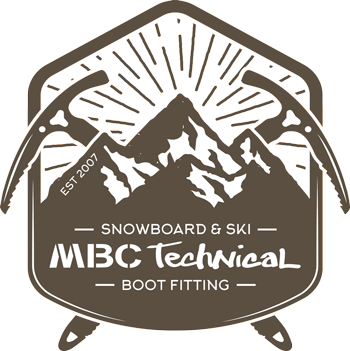 Remember new Ski and Snowboard boots WILL pack down over time so they need to be very snug when you are in the shop. If they feel like slippers they are probably too big!